Angelina Jolie wrote an article for the NY times, titled ‘My Medical choice’ this week, detailing her decision to have a double mastectomy. Angelina has received a lot of positive feedback but a lot of people can’t understand why she did. Unless you know what it is like for a family member to go through cancer, like Angelina and I have, I guess it would be hard to understand why a healthy women would chose to have a double mastectomy. 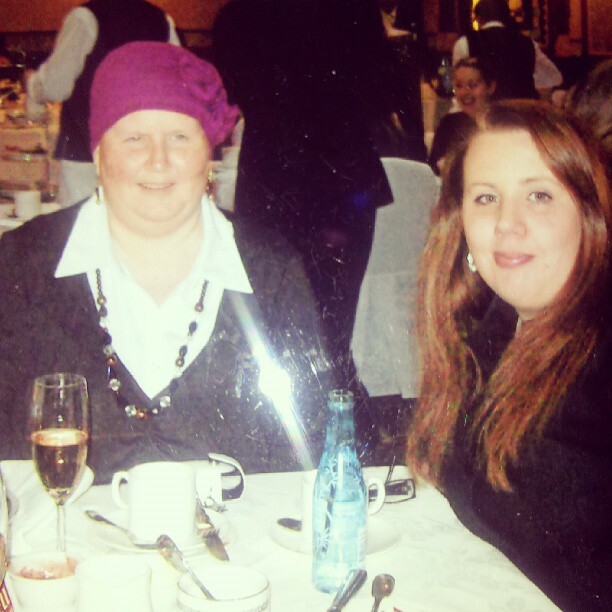 As a lot of you know, my Mum passed away from secondary cancer on Father’s Day, September 2012. Mum was diagnosed with an aggressive form of breast cancer in 2006, her left breast and lymph nodes were removed and she endured months of chemotherapy and radiation therapy. Both therapies aren’t very nice on the body; causing extreme tiredness, debilitating nausea, pain, hair loss, dry skin, rashes and constipation… just to name a few of the nasty side effects. A year later, Mum was in remission but those who know people who have gone through chemotherapy and radiation therapy know that the side effects can last years. Mum was still not well and tired a lot but doing ok. In 2008, Mum had a recurring cough which was put down to a chest infection and/or asthma but after a month, it wasn’t clearing up, so xrays were ordered. Spots of cancer where on the back of her left lung. Obviously, since the cancer was in an obscure area, the cancer couldn’t be removed. So again, Mum was placed on chemotherapy. Six moths later, Mum had an MRI done and it was found the cancer was now in her left rib bones, hip bone and shoulder. Ongoing chemotherapy via intravenous and tablet form and radiation therapy slowed the rate the cancer was spreading over the next two years and Mum was able to do a few things she enjoyed in between treatments, such as coming to visit us or going away with her partner for a few nights at a time. 2011 and 2012 were not the best for Mum. She nearly died twice. Once from an intravenous port being put in wrong, puncturing her lung and her lungs becoming badly infected. Mum is a fighter and was soon out of hospital and doing the craft she loved to do. The second time, her body shut down from a build up of Morphine. To see your Mother not know where she is and or able to communicate is a horrible experience and I wouldn’t wish it on anyone. At one point she was sound asleep and the nurse couldn’t rouse her. That also scared my brother and I. Thankfully, Mum was only in a very deep sleep. For the last six months of her life, Mum was getting increasingly frustrated with her inability to do much. She was quickly out of breath and because of the power pain management drugs she was on, she was struggling to stop shaking . Mum loved sewing, patchwork, crochet and knitting, so it was annoying her no end that she was finding it hard to do the things she loved. On my birthday last year (28th August), I received call from Mum’s partner to tell me Mum had been put into hospital again as she was having trouble breathing but she was ok. I asked if he wanted me to come down (they lived 5 hours away) and he said not to worry but he will keep me informed of what was happening. I got down there late afternoon on the 31st, Mum was happy to see me and chatted ok but was very tried and weak. My (middle) brother was on holiday in Vietnam and I was trying to get hold of him and couldn’t. I had to message him on his Facebook and let him know what was happening. He was doing his best to try and get flights back to Melbourne. My youngest brother, Mum’s partner and I took turns staying with her that night and over the next 48 hours. On the 1st, Mum was in and out of consciousness and chatted a bit but getting worse and finding it harder to breathe. On the Sunday morning, I asked the nurses how long this might go on for and they said it could be days or weeks, they didn’t know. My brother had to go home and feed his cat, as he had rushed down there to be with Mum from work, but was going to come back the next day. The nurses said it would be ok.
By 11am, Mum was getting worse and asking for more morphine. To see your loved one struggling with each breath is absolutely heartbreaking. The nurses told us to say our goodbyes as her body was shutting down. At 1pm, Mum stopped breathing. You hope with all your heart that this is a nightmare and you are going to wake up. That Mum is ok, everything will be ok and she will always be there. On the other side, you know that she is now in a better place, no more pain and suffering but the selfish part of you will always want your Mum there with you. So, there was my Mum’s cancer story and to tell you the truth, after watching her go through everything relating to the cancer and the pain and suffering she endured. I would never, ever want to get breast cancer (or any cancer really). I would never want my boys going through what I had to with Mum. Because Mum only found out late in life she was adopted, I will never know if it is a genetic or not. I spoke to my doctor about this a few weeks ago and she recommended I am extra vigilant on any breast changes and to have regular mammograms from when I turn 40 (two years time). I am petrified of any changes I find, even just regular monthly changes. It is always something that is in the back of your mind. I am seriously considering having a blood test done to determine if I have the BRCA1 gene. If I am at a high risk of developing cancer, I can tell you now, I will not hesitate to remove my breasts or ovaries to prevent getting this horrible disease. To those who say that I would be ‘mutilating’ my body, I’m sorry but living a full life with my children is much more important than two wobbly things on my chest! If, like Angelina Jolie, my risk was 90% and removing my breasts brought that risk down to only 5%, then I wouldn’t hesitate to do it. To those who say ‘Why do something to prevent something that ‘might’ not happen?’, isn’t prevention better than a cure? Until you have lived though the nightmare that is cancer with someone you love, please don’t judge others who will do what they have to do in order to prevent cancer. If you need more information or would like to donate to help women in the same position, I can’t recommend the organisation Pink Hope enough. Pink Hope is Australia’s first community designed to inspire women to be proactive and vigilant with their breast and ovarian health, while providing a safe haven for high risk women to connect. http://pinkhope.org.au/ or make a purchase in the Pink Hope store: http://pinkhope.org.au/shop/. What a moving story, Kellie. So sorry that your mum and you had to go through this. I’d be having the test, too, if I was in a similar situation and can totally understand the preventative nature of Angelina’s drastic surgery. Not so drastic if you want to see you kids grow up. Thank you for sharing your story – I know it can’t have been easy to relive all of that. I cannot imagine how heartbreaking it must be to watch your Mum suffer like that. You are an amazing daughter. I would be having the tests to make sure i take every step there is to make sure I won’t/can’t get it. I think it was great for her to do that and better for her too. Just wanted to send you love and along with the others who have commented, thank you for sharing your story – it can’t have been easy. Thanks for sharing your story.I’m sorry to hear about your Mum. I agree life with my children is much more important than two wobbly things on my chest. I don’t mind having had a double mastectomy with no reconstruction planned. It makes running a lot easier.